Suzette Meléndez, Lecturer and Director of the Children’s Rights and Family Law Clinic, recently delivered the keynote address at the 40th Annual New York State Bar Association Law, Youth and Citizenship conference. Professor of Practice David Crane recently spoke with Al Jazeera about the Hatch Act in reaction to the FBI’s recent Hillary Clinton email announcement. William C. Banks, Board of Advisors Distinguished Professor and Director of the Institute for National Security and Counterterrorism, was recently quoted in the article “Waging War with No Bombs or Missiles” in the San Diego Union-Tribune. Associate Professor of Law Tara Helfman’s review of Yale Law Professor Akhil Reed Amar’s latest book, “The Constitution Today: Timeless Lessons for the Issues of Our Era”, has been published by The Weekly Standard. 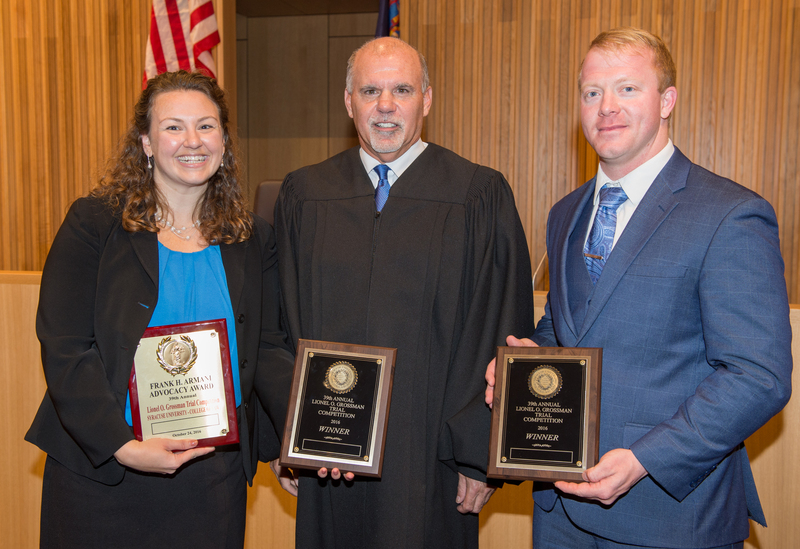 Colleen Gibbons 3L and Justin Wilson 3L were declared the winners of the College of Law’s 39th Annual Lionel O. Grossman Trial Competition, prevailing over Abdel-Rahman Hamed 3L and Ryan Lefkowitz 2L.